Autism and Autism Spectrum Disorder (ASD) are complex neurodevelopmental disorders. Susceptibility is believed to be the interaction of genetic heritability and environmental factors. The synchronous rises in autism/ASD prevalence and paracetamol (acetaminophen) use, as well as biologic plausibility have led to the hypothesis that paracetamol exposure may increase autism/ASD risk. To explore the relationship of antenatal paracetamol exposure to ASD, population weighted average autism prevalence rates and paracetamol usage rates were compared. To explore the relationship of early neonatal paracetamol exposure to autism/ASD, population weighted average male autism prevalence rates for all available countries and U.S. states were compared to male circumcision rates – a procedure for which paracetamol has been widely prescribed since the mid-1990s. Prevalence studies were extracted from the U.S. Centers for Disease Control and Prevention Summary of Autism/ASD Prevalence Studies database. Maternal paracetamol usage and circumcision rates were identified by searches on Pub Med. Using all available country-level data (n = 8) for the period 1984 to 2005, prenatal use of paracetamol was correlated with autism/ASD prevalence (r = 0.80). For studies including boys born after 1995, there was a strong correlation between country-level (n = 9) autism/ASD prevalence in males and a country’s circumcision rate (r = 0.98). A very similar pattern was seen among U.S. states and when comparing the 3 main racial/ethnic groups in the U.S. The country-level correlation between autism/ASD prevalence in males and paracetamol was considerably weaker before 1995 when the drug became widely used during circumcision. This ecological analysis identified country-level correlations between indicators of prenatal and perinatal paracetamol exposure and autism/ASD. State level correlation was also identified for the indicator of perinatal paracetamol exposure and autism/ASD. Like all ecological analyses, these data cannot provide strong evidence of causality. 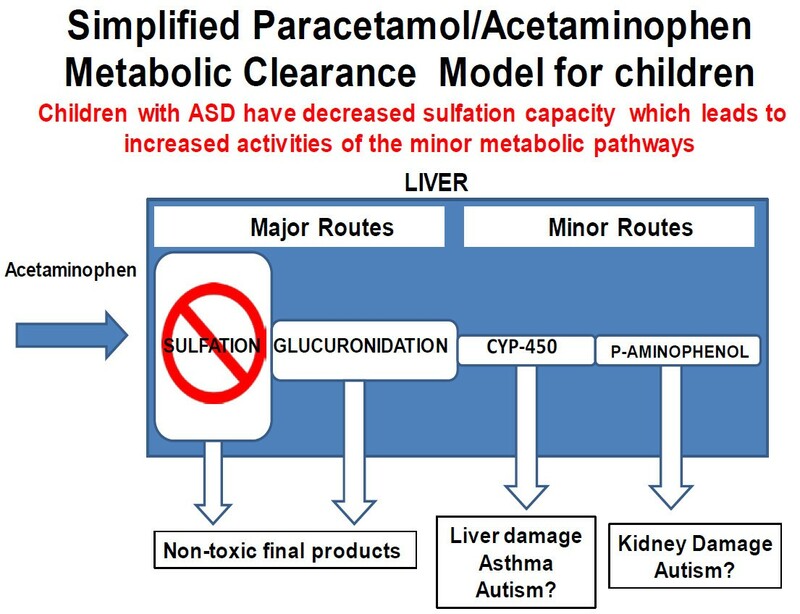 However, biologic plausibility is provided by a growing body of experimental and clinical evidence linking paracetamol metabolism to pathways shown to be important in autism and related developmental abnormalities. Taken together, these ecological findings and mechanistic evidence suggest the need for formal study of the role of paracetamol in autism. Autism Spectrum Disorder (ASD) is a severe developmental disorder defined by social deficits, communication deficits, repetitive behaviors and fixated interests that appear in early childhood [1, 2]. Despite a large and rapidly expanding body of literature, the etiology of ASD remains poorly understood. There is substantial evidence implicating oxidative stress, inflammation and immune dysregulation, although no single coherent explanation has emerged . Recent twin studies provide evidence that susceptibility to ASD may have significant environmental components, in addition to genetic heritability [4, 5]. Several lines of evidence suggest that medication use in pregnancy and early childhood may play a role in ASD etiology. Specifically, Torres and, Becker and Schultz, have hypothesized that paracetamol (acetaminophen, N-acetyl-p-aminophenol, or APAP) has increased ASD risk [6, 7]. It has been shown that autistic children have a decreased capacity to sulfate paracetamol, which is the primary metabolic route for children . When paracetamol is metabolized through the alternative routes it has been shown in humans to induce oxidative stress and immune dysregulation . A recent investigation found transcriptomic changes in full-genome human miRNA expression indicating, for the first time, immune modulating effects and oxidative stress responses to paracetamol even at low doses . Studies in animals have shown paracetamol to induce apoptosis and neurotoxicity [11, 12]. Several studies hypothesize increased apoptosis in the autistic brain [13–16]. Paracetamol is one of the most common antipyretic analgesic medicines worldwide. In 1980, after sufficient evidence emerged of an association between salicylates and Reyes syndrome, paracetamol essentially replaced aspirin as the primary treatment of fever in children and pregnant women [17, 18]. Since that date, paracetamol consumption throughout the world has increased dramatically . Paracetamol sales in the United States (US) have had a continual upward trend. In 1982, US paracetamol sales were approximately $400 million; by 2008 they had risen to $2.6 billion [20, 21]. Although prevalence data for autism and ASD are of uncertain accuracy, many authors report strong increases in prevalence over this same time period. Theoharides and colleagues for example reported prevalence prior to 1980 as approximately 4/10,000 and Baio et al. estimated that US autism/ASD prevalence to have risen to about 110/10,000 today [22, 23]. Observing the correlation between two parallel time trends is of limited inferential utility; however the paracetamol – ASD link is strengthened by an observation first made by Becker and Schultz . In 1982 and again in 1986, product tampering led to a few bottles of a leading brand of paracetamol tablets being contaminated with cyanide. In each case, a rapid and brief decline in paracetamol sales occurred, with the long term upward trend recovering within a year. In three populations for which good data are available, Becker and Schultz noted that brief dips in the rising autism prevalence curves mirrored these sales anomalies. The prevalence curves continued their upward trend after 1988. Several lines of evidence suggest that the etiologically relevant period for the development of ASD may be in utero or possibly in early infancy [24, 25]. We sought additional evidence to test the hypothesis that use of paracetamol in pregnancy or in early childhood might be a risk factor for ASD. Studies have reported population variation in prescribing patterns and usage rates which has allowed us an opportunity to investigate the correlation between prenatal exposure to paracetamol and autism spectrum disorder prevalence. Additionally, we noted that analgesic prescribing habits for neonates and infants changed in the mid 1990’s with a shift in perspective on neonatal pain which has afforded us an additional opportunity to look at population variation in analgesic use . Research beginning in the 1980’s documented the negative consequences associated with inadequate treatment of pain in children [27–29]. Pain guidelines specifically for children were established in 1992 by the Agency for Health Care Policy and Research, in 1998 by the World Health Organization and in 2001 by the American Academy of Pediatrics [30–33]. A common neonatal medical procedure is circumcision, which typically occurs during the postpartum hospital stay, within the first two days of life for a vaginal delivery and first four days for a cesarean section . Prior to the 1990’s circumcision was generally performed without analgesics. A 1994 study by Howard et al. found that when paracetamol is given regularly every 6 hours for at least the first 24-hour postoperative period, infants demonstrated decreased responses to pain . This study lead to the development of circumcision pain management guidelines by the American Academy of Pediatrics  and others [37–39]. These guidelines include the suggestion of a first dose of paracetamol two hours prior to the procedure, and doses every 4–6 hours for 24 hours following the procedure. Thus newborn males often receive 5–7 doses of paracetamol during the developmentally vulnerable initial days of life. Variations in circumcision frequency in different populations allowed us an additional approach to investigate the correlation between paracetamol use and ASD prevalence. This hypothesis seemed particularly relevant in light of the approximately 4.6 times higher prevalence of autism in males compared to females . Two separate analyses were conducted. The first examined the association between prenatal paracetamol exposure and ASD prevalence using maternal usage data as a proxy for prenatal exposure. The second analysis investigated the association between circumcision rates as a proxy for early life paracetamol exposure in males and ASD prevalence. To investigate the relationship of ASD to prenatal exposure to paracetamol, population maternal paracetamol usage rates were compared to population autism prevalence rates for as many countries as available data permitted. The population autism prevalence rates utilized were from studies reported in the U.S. Centers for Disease Control and Prevention Autism Prevalence Summary Table . The maternal paracetamol usage rates by country were drawn from studies identified by a systematic search of the peer reviewed medical literature using the National Library of Medicine’s Pub Med database. The Autism Prevalence Summary Table from the Center for Disease Control website  summarized the results of 59 prevalence studies conducted worldwide. This table recorded the author, year published, country, time period studied, age range studied, number of children in the population, the identification criteria, the methodology used and the prevalence. The oldest and youngest birth years in each study were calculated based on the time period and age range studied. Each study was extracted to verify the table results and to identify the ratio of males to females to calculate the male prevalence of autism/ASD. Generally, the CDC Prevalence Summary Table reported the more narrowly defined autism rate rather than the more inclusive diagnosis of autism spectrum disorder (ASD). The CDC Prevalence Summary reported the ASD rate for the Kim 2011 study in South Korea; however for consistency with all other results, the more narrowly defined autism rate was extracted and utilized in this analysis . Two older studies referred to in the CDC table could not be located and were excluded (Lotter et al. 1966) (Brask et al. 1970). Two additional study were excluded, the first because of incomplete case ascertainment  and the second because of lack of total population data . A total of 55 studies from the CDC summary were utilized in this analysis (Additional file 1). Maternal paracetamol usage rates were extracted from studies examining the use of paracetamol in pregnancy and relationships to other outcomes. A search of the English language literature on Pub Med was conducted for the past 20 years with a search date of April 18, 2012 using the terms prenatal, maternal, pregnancy, acetaminophen, paracetamol, medication, drugs, analgesic, pain relief, over the counter, and the different country names. Various combinations of the terms were used to maximize the results. If a study appeared to be relevant it was extracted and reviewed to identify a maternal paracetamol usage rate. If data were found only for overall analgesics, nervous system drugs, all over the counter medications or all western pharmaceuticals an assumption was made that paracetamol use represented 80%, 80%, 70% and 60%, respectively. These proportions were established a priori, conservatively approximated based on the findings of the US National Birth Defects Prevention Study and used for all studies regardless of country . This literature search yielded 33 studies with medication usage rates for 14 out of 17 countries with autism prevalence rates. Two studies were excluded because they were subsets of two included studies to yield a total of 31 studies [44, 45]. If multiple studies were identified for a country a summary usage rate was calculated using the weighted average by study population size. The characteristics of the prenatal medication usage studies are summarized in Additional file 2. Because of concerns of changing autism prevalence rate over time, an a priori decision was made to restrict the analysis to include autism prevalence studies in which the range of birth years had at least one year of overlap with the range of birth years of the prenatal paracetamol usage studies. If multiple autism prevalence studies met this criterion for a given country, a weighted average based on study population size was calculated. This reduced the number of prenatal exposure studies used in this analysis to 20. There were inadequate data available to conduct a U.S. state level analysis. To investigate the relationship of early life paracetamol exposure for male neonates to autism spectrum disorder, population circumcision rates were compared to male population autism prevalence rates for two time periods. Male autism prevalence rates calculated from studies reported by the Center for Disease Control in the Summary of Autism/ASD Prevalence Studies (described above) were compared to male circumcision rates from studies identified by a systematic search of the peer reviewed medical literature using the National Library of Medicine’s Pub Med database. 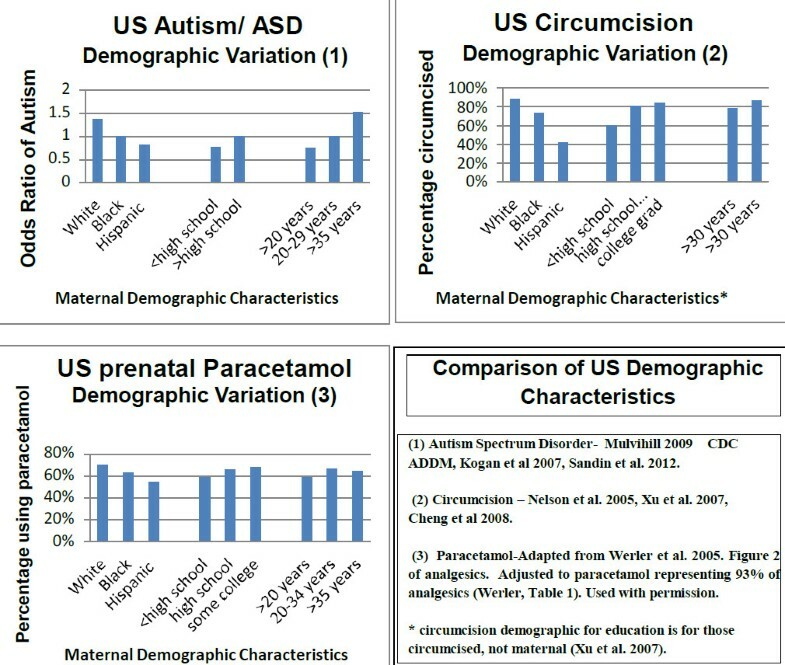 An additional U.S. state level analysis was done with available data (limited to the more recent time period) by comparing state and time period stratified male autism prevalence rates from the U.S. studies from the CDC Autism Prevalence Summary Table to newborn circumcision rates from the Health Care Utilization Project . The circumcision rates were obtained by systematic search of the peer reviewed medical literature using the National Library of Medicine’s Pub Med database. A search of the English language literature on Pub Med was conducted using the terms circumcision and the different country names. The circumcision rates utilized the best identified information. If infant circumcision rates were available, they were utilized over national rates. If changing rates were presented, the rates for years closest to the study birth years were utilized. When a published paper was not available the rate was estimated. The estimation was calculated using the same methodology as the World Health Organization and the Circumcision Independent Reference and Commentary Service, calculated from the sum of the numbers of Jewish and Muslim males [47, 48]. Data for the percentage of Jews by country were obtained from the Jewish Virtual Library . Data for the percentage of Muslims by country were obtained from a Pew Forum report . While most Jewish and Muslim males are circumcised, true circumcision rates are unknown and circumcision rates based upon religion are only an approximation. Both the World Health Organization and the Circumcision Independent Reference and Commentary Service indicated that this would likely underestimate the true prevalence (see Additional file 3). Annual U.S. state level infant circumcision rates were available for eight years between 1997 and 2006 from the Health Care Utilization Project (HCUP) of the Agency for Health Care Research and Quality (AHRQ) of the United States Department of Health and Human Services. Thirteen states had complete data for this eight year period and an additional seventeen states had partial data [46, 51]. For the data analysis, the studies of autism prevalence were divided into two time periods. The first consisted of all prevalence studies in which all subjects were born before 1995 (35 country level studies). The assumption is that during this time period paracetamol would not generally have been administered during the circumcision procedure. The second, post-1995 cohort includes prevalence studies in which some subjects were born after 1994 (1995+), (20 country level studies) when circumcision pain was first recognized and treated. The assumption is that during this time period some portion of the cohort would have been administered paracetamol during the circumcision procedure. For countries with multiple studies in a time period, a summary prevalence was calculated using a weighted average based on study population size (Additional file 3). An additional U.S. state level analysis was conducted for the post-1995 cohort. Similarly, for states with multiple studies in a time period, a summary prevalence was calculated using a weighted average based on study population size. State level circumcision data were not available to conduct a pre-1995 analysis [Additional file 4]. Each of the data sets was checked for normality using standard graphical and statistical methods. Within the limits of these small datasets, the normality assumption was not seriously violated and so Pearson’s parametric correlation coefficient was used with an information weighted (1/variance) linear regression model. For the country-level analyses, synchronous data were available from 8 countries. A country’s average prenatal paracetamol consumption was found to be correlated with its autism/ASD prevalence (r = 0.80, Figure 1 and Additional file 5). The trend among the 8 countries indicates that a change of 10% in population prenatal paracetamol usage was associated with an increased autism population prevalence of 0.53/1000 persons (95% CI: 0.13 to 0.93) (Figure 1). 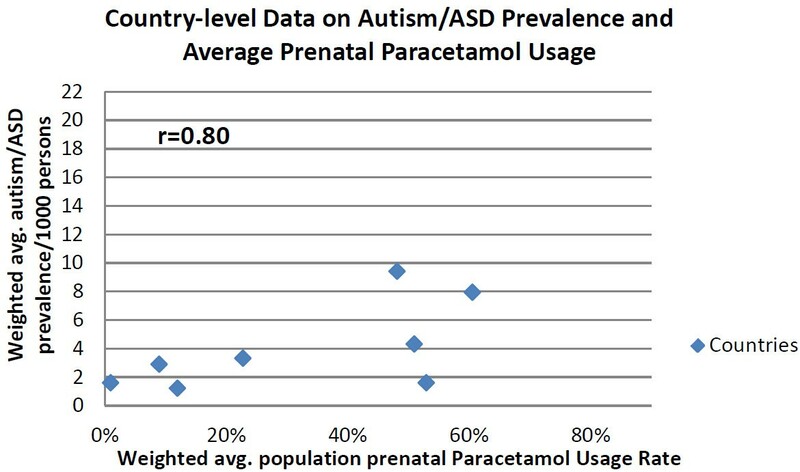 Graph of country-level data on Autism/ASD prevalence and average prenatal paracetamol usage. The Autism/ASD prevalence and the prenatal paracetamol usage rates are both population weighted averages of all the respective studies for a country. (See Additional files 2 and 5). A strong correlation (r = 0.98) was found in the country-level data between circumcision and autism spectrum disorder prevalence rates for boys born after 1995 (when circumcision guidelines began recommending analgesics). 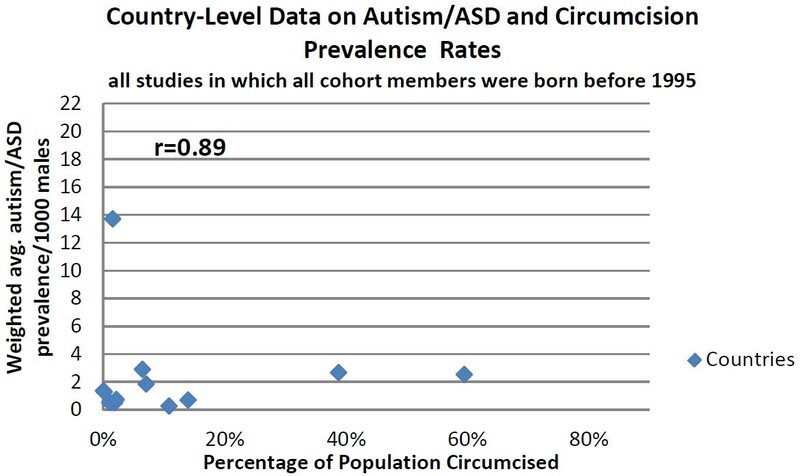 The slope of this trend for the 9 countries with available data indicates that a change of 10% in the population circumcision rate was associated with an increase in autism/ASD prevalence of 2.01/1000 persons (95% CI: 1.68 to 2.34) (Figure 2). 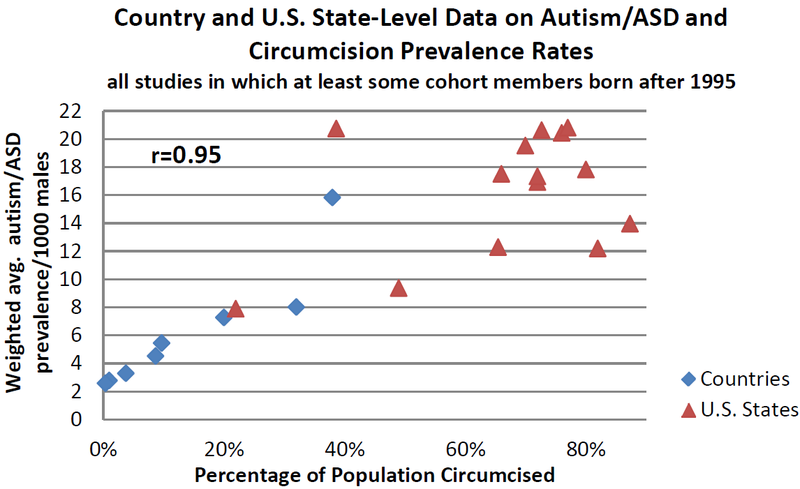 Graph of country and U.S. state- level data on Autism/ASD and circumcision prevalence rates. All studies in which at least some cohort members were born after 1995. This graph includes country-level studies with the U.S. stratified to state-level studies for the post-1995 cohort (no overall U.S. data point). The assumption is that, due to changes in neonate prescribing practices in the mid-1990s, some cohort members in each study would likely be exposed to paracetamol at the time of circumcision. Autism rates are population weighted averages of all studies for a country or U.S. state. (See Additional files 1, 3, 4 and 5). Data were available for 12 countries for boys born before 1995 (Figure 3), and the trend in the data was weaker; the correlation between circumcision prevalence and autism/ASD prevalence was still good (r = 0.89), but the slope of the trend was only a sixth of that for the later period for a 10% change in circumcision rate, there was an increase in autism/ASD prevalence of 0.35/1000 persons (95% CI: 0.22 to 0.47). 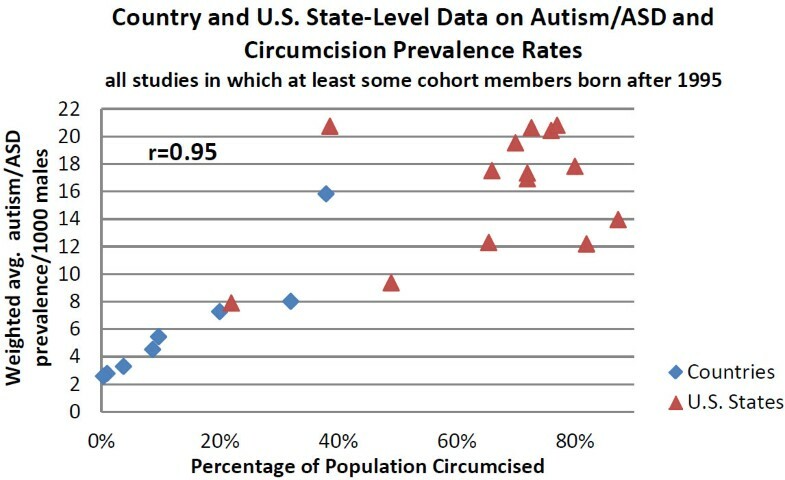 Graph of country-level data on Autism/ASD and circumcision prevalence rates. All studies in which all cohort members were born before 1995. The assumption is that all of the cohort members in each study would not likely be exposed to paracetamol at the time of circumcision. U.S. state level data was not available for this pre-1995 cohort. Autism rates are population weighted averages of all studies for a country. (See Additional files 1 and 3). Across all country-level studies prior to the widespread use of paracetamol for circumcision (all born prior to 1995), the weighted average autism/ASD male to female prevalence ratio was 3.9 to 1. For the post 1995 cohort, this ratio increased to 5.6 to 1. Available data allowed a parallel analysis of U.S. states post-1995, but not for the earlier period. The data for the 14 U.S. states with available data show a remarkably similar pattern to the 8 countries (this set of countries does not include the U.S. to avoid double counting) for the same time period (Figure 2, r = 0.95). These ecological analyses identified positive correlations between autism/ASD prevalence and indicators of both prenatal and very early life paracetamol exposures. If these patterns are confirmed in formal epidemiologic studies, the use of paracetamol during pregnancy and at the time of circumcision may help to explain autism/ASD prevalence variations between the sexes, among countries, and within U.S. states and ethnic groups. The close to six-fold difference in rate of change in autism/ASD prevalence before and after the recognition of pain at the time of circumcision is suggestive of a possible effect caused by the shift to the use of paracetamol. The change in the overall time period average male to female autism/ASD prevalence ratio (weighted by study size) from 3.9 to 1 in the unexposed time period to 5.6 to 1 in the second time period with a probable paracetamol exposure may also be suggestive an effect from this exposure. It is important to acknowledge that this analysis has numerous and significant limitations. First and foremost, correlation is not causation and as such no causal inference is intended. Homogeneity of exposure and prevalence assessment methodologies among the studies has been assumed, but each may be subject to misclassification, confounding and bias. The change in autism/ASD prevalence, circumcision prevalence and paracetamol usage rates over time may not have been adequately addressed. Circumcision rates are presented as a proxy for an early male neonatal exposure to paracetamol. However, this assumption is not without significant limitations. The timeline for the actual implementation of child pain management protocols and the utilization of paracetamol with circumcision is not known. Additionally, pain management guidelines suggest that paracetamol alone is not sufficient to manage circumcision pain so a nerve block or local anesthesia may also be administered, which may be confounding factors. In general, this type of ecologic study has significant limitations that severely limit causal inference. Ecologic bias or the failure of ecological associations to correspond to biologic effects at the individual level is a concern. It has been shown that the relations seen in country level data may poorly reflect the relationships that exist on an individual basis . Despite these limitations, the consistent patterns reported here support the need to further investigate this potentially important hypothesis. Previous research has identified paracetamol usage trends that curiously coincide with the rise in prevalence and population demographics of autism/ASD. In the US Slone Epidemiology Center Birth Defects study paracetamol was the most commonly used medication amongst all subjects with usage higher during pregnancy than before pregnancy. In the early 1980’s about 42% of women used paracetamol during the first trimester of pregnancy. The rate climbed to over 65% in the early 1990’s, where it has essentially remained through 2004 . Maternal viral infection requiring hospitalization during the first trimester and maternal bacterial infection in the second trimester have been associated with diagnosis of ASD in the offspring (Hazard ratios 2.98 (95% CI: 1.29 to7.15) and 1.42 (95% CI: 1.08 to1.87), respectively) . In a recent study, maternal self-reported influenza was associated with a twofold increased risk of infantile autism and a febrile episode lasting more than seven days was associated with a threefold increased risk . Each of these maternal infections or a prolonged febrile episode would likely increase the exposure to paracetamol. In the U.S., usage of paracetamol by pregnant women mirrors the population demographics of women whose children develop autism spectrum disorder, by race, age and education [18, 55, 56]. The population demographics for mothers who circumcise their children are also very similar, with rates increasing with socio-economic status and insurance coverage rates [57–59]. Studies have shown that a parent’s own usage rates of paracetamol and other medications correlate with what they give to their children, so a similar demographic usage pattern would be expected for childhood exposure [60, 61]. This synchronous U.S. pattern may be suggestive of an additive nature of both prenatal and early life exposure to paracetamol and a relationship to autism/ASD (Figure 4). Comparison of U.S. demographic characteristics. Comparison of U.S. autism prevalence rates, circumcision rate and prenatal paracetamol usage rates by maternal race, education level and age. Paracetamol is the most common drug administered to US children and the predominant analgesic/antipyretic drug among children up to 24 months of age . Paracetamol is suggested for pain management following vaccinations. 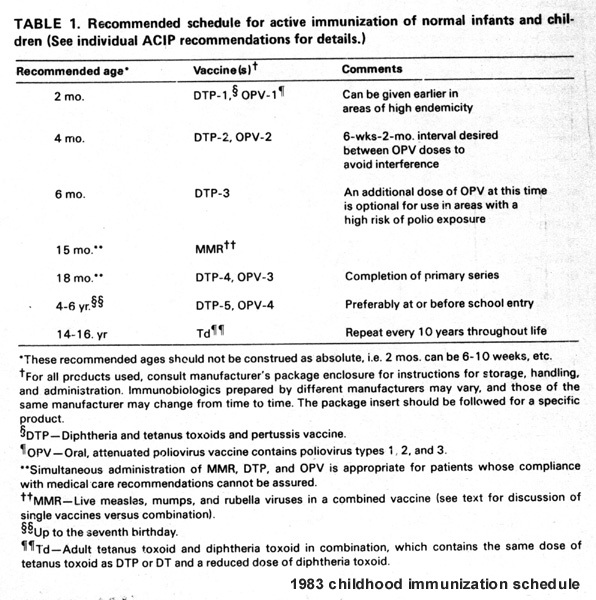 In 1983 the average U.S. child received 8 immunizations before age 2. In 2011, the average was 25, a 313% increase [63, 64]. From the perspective of the current hypothesis, these represent increased opportunities for paracetamol exposure in pain management (although administering several vaccines at once means analgesia may not increase proportionally). A recent study representing one-fifth of all pediatric hospital admissions in the U.S., identified paracetamol as the most common drug administered to children over one year of age and the second most common drug administered for those under one year; more than 40% of hospital stays in both groups include paracetamol . Hospitalization of children and neonates for infection as well as non-infectious disease have been associated with increased risk of ASD in a large Danish cohort (hazard ratios 1.38 (95% CI: 1.31 to 1.43) and 1.76 (95% CI: 1.68 to 1.86), respectively) . Paracetamol has four important metabolic pathways (Figure 5). The two main pathways are glucuronidation and sulfation. Paracetamol is mainly metabolized in the liver via conjugation with glucuronide and sulfate and then excreted. Both these metabolic routes yield inactive, non-toxic final products. Glucuronidation is the primary metabolic pathway in adults and sulfation is the primary pathway for paracetamol metabolism until age 10–12 years . Neonates, in general, have lower capacity to metabolize drugs due to the underdevelopment of the glucuronidation pathway and inefficiency and immaturity in renal function . Three studies of neonates with postnatal age ranging from 1–3 days obtained a glucuronidation/sulfation (G/S) ratio between 0.12 and 0.28 [69–71]. This is in contrast to 11 month old children with a significantly higher G/S ratio of about 0.7 and adults with a G/S ratio approaching 2.0 [71, 72]. Low birth weight and bilirubinemia have also been found to reduce glucuronidation capacity, both of which have been associated with autism [73–76]. Autistic children have been shown to have abnormal sulfate capacity and have been shown to have a specific inability to sulfate paracetamol [8, 77, 78]. Parents of autistic children have also been shown to have abnormal transsulfuration metabolism . When the capacity to metabolize through the primary pathways is depleted or saturated, the fraction of the dose converted to reactive metabolites increases and the secondary metabolic pathways become increasingly involved . Metabolic pathway model for paracetamol. One of the two secondary pathways is cytochrome P-450 (CYP P-450) mediated, forming a highly reactive metabolite, n-acetyl-p-benzoquinoneimine (NAPQI) which reacts with cellular glutathione (GSH) to form a non-toxic conjugate, which is subsequently excreted. Once GSH is exhausted, NAPQI binds to cellular proteins, including mitochondrial proteins reducing the ability to detoxify, which can lead to oxidative stress, immune system activation, hepatocellular death, nephropathy and asthma [10, 19, 81, 82]. It has been shown that paracetamol treatment induces greater glutathione depletion in male mice [11, 83]. Alterations in GSH homeostasis have been a consistent observation among autistic children and their mothers [84–87]. Also, decreased glutathione levels have been associated with preeclampsia . In the Danish Birth Cohort, women who used paracetamol during the third trimester of pregnancy had increased risk of preeclampsia RR = 1.40 (95% CI: 1.24 to 1.58) . In two studies, maternal preeclampsia has been associated with increased risk of having a child with ASD (OR = 1.69 (p = .0005) and RR = 1.64 (95% CI: 1.08 to 2.49), respectively) [90, 91]. Additionally, during pregnancy a women’s sulfation capacity is reduced which may precipitate activation of immune responses, via this P-450 pathway [92, 93]. The activation of immune response and pro- inflammatory cytokine interleukin signaling has recently been detected even at therapeutic doses of paracetamol [10, 94]. Converging evidence highlights the important role of many of the same cytokines in mediating maternal immune activation effects on the neurodevelopment of autistic offspring [95–105]. A fourth metabolic pathway, accounting for about 6% of paracetamol metabolism, has been identified that is believed to be related to the mechanism of analgesic action . This pathway involves deacetylation of paracetamol in the liver producing p-aminophenol that conjugates with arachidonic acid in the brain and in the spinal cord [107, 108]. P-aminophenol is recognized to be involved in paracetamol nephrotoxicity [81, 109]. More recently, P-aminophenol has been shown to produce a significant loss in mouse cortical neuron viability at therapeutic concentrations . This suggests another possible pathway for a neurotoxic effect of paracetamol when the principle metabolic routes are exhausted. In summary, there are several lines of evidence that suggest that prenatal and or early life paracetamol exposure may adversely affect neurodevelopment. Prenatal exposure may trigger maternal immune activation with possible effects on fetal brain development. In early life, maturational compromises to the glucuronidation pathway at the time of the circumcision related exposure, in combination with the compromises to the sulfation pathway that typify autistic children, may lead to utilization of the suboptimal secondary metabolic routes with the potential for adverse neurological effects in susceptible individuals [110–112]. In this hypothesis generating exploratory analysis, several lines of evidence support the plausibility of a relationship between prenatal and early life exposure to paracetamol and autism spectrum disorder. It is proposed that the use of paracetamol in pregnancy and/or early childhood may alter immune processes increasing the risk of autism spectrum disorder in susceptible individuals. In an ecologic analysis, with all the previously discussed limitations, a correlation was found between maternal prenatal use of paracetamol and autism spectrum disorder. Additionally, a correlation was identified for the first time between neonatal circumcision with a probable paracetamol exposure and autism spectrum disorder. These relationships along with the synchronous rise in use of paracetamol and ASD, the convergence of the potential biologic mechanisms and the identification of plausible causes of increased male susceptibility provide consistent evidence of an association. Large scale population based epidemiologic studies are needed to confirm or disprove this association. The authors would like to acknowledge the contribution of Sharon Ayoob who identified the male neonate exposure to paracetamol at the time of circumcision. The authors are grateful to Dr. Manuel Cifuentes for contributions to the metabolic model design and data interpretation. The authors are also grateful to David Skinner for assistance with data collection and Dr. Rebecca Gore for contributions to the statistical analysis. AB conceived of the study, made substantial contributions to its design and coordination, acquired the data, performed the data analysis and drafted the manuscript. DK made substantial contributions to concept and design, and revised the manuscript critically for intellectual content and data interpretation. Both authors read and approved the final manuscript.